From country New South Wales to all major cities along the eastern sea board, at Ron Crouch Transport we aim to deliver on our promise of ‘Transport you can trust.’ From our company owned vehicles to our collaborative partnerships with a large number of sub-contractors, at Ron Crouch Transport we endeavour to not only ensure that your goods are delivered efficiently and affordably. We also uphold high standards of maintenance, safety and reliability, replacing our prime mover vehicles every 4-5 years and our trailers every 7. We hold NHVAS Maintenance Management, Trucksafe and NHVAS Basic Fatigue Management accreditations for your peace of mind. To give you the confidence that we can securely deliver your goods. Currently, we house a fleet of 37 vehicles, 46 trailers and 2 tankers – all the latest models – that are fully capable of delivering a variety of products to anywhere in Australia or internationally. Animal nutrition, industrial and agricultural chemicals, manufactured timber, canned foods, rural supplies and automotive parts… you can choose from a combination of our vans, b-Doubles, drop decks, flat tops and tautliners to create a transport unit with the right set of capabilities for your delivery. Owning our fleet, topped with our numerous affiliations with reputable sub-contractors ensures we have the equipment and network capable of satisfying any substantial short term fluctuations in our customer demands. We currently cater to over 1700 companies across a variety of sectors, so it is important that our team are able to adapt to your requirements with minimal or no notice. And they do just that – every day, on demand, without compromising your delivery! From changes in freight types to alterations in volume, our team of highly trained and capable staff, efficiently implement your required modifications to ensure the continued success of your delivery. We believe in earning your trust. In providing a level of service that is professional, memorable and considerate of your ever changing needs and logistical requirements. That is why we only employ drivers with a proven history of top quality driving. Drivers who are regularly subjected to medical assessments, up-skilling and training to ensure that your delivery remains in safe hands. 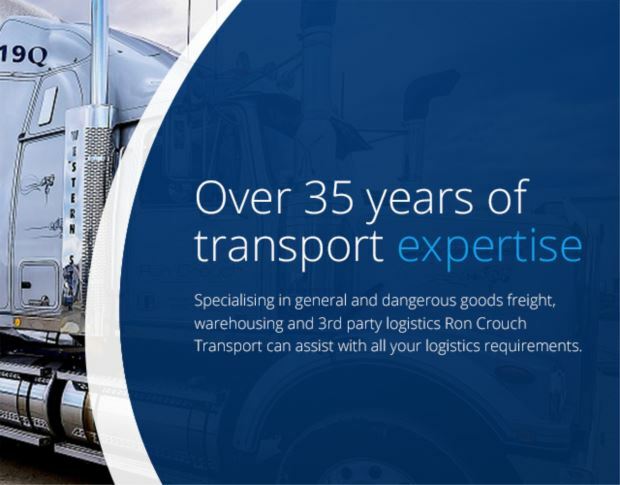 Whether you are looking for a transport company who can optimise your results or simply want a quote; call or email us at Ron Crouch Transport today with your pick-up instructions and we will do the rest. From Sydney, Wagga Wagga, Brisbane, Adelaide, Melbourne or regional Australia, no matter the location, you can feel confident in the quality of our delivery and support.